Imagine having a secret haven in the heart of Upper Claremont! People have called it a tree house, a log cabin, a cottage, a sanctuary, a romantic hideaway! 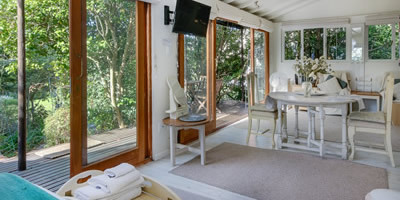 This is a magical open plan living space hidden in its own leafy glen in the beautiful grounds of the main guest house at Avenue Torquay. Decorated in different hues of white, the Garden Cabana is a fully equipped self-catering cottage, which enjoys all the features of the establishment, and all of its beauty and tranquility, with full access to the garden and pool, and other amenities offered by the guesthouse. It has a private deck for out door eating and a large deck for private sunning. A little haven in the best suburb in Cape Town…Airy, light and quite charming! Open plan studio style cottage suitable for a single person seeking privacy or a couple. All wooden exterior: all white interior. Lovely outdoor decking area for chilling. Double bed with sumptuous linen and feathers, and optional single bed for a family. Fully equipped for catering: Microwave, fridge, plate cooker, mini oven, and plug ins. Separate loo-room has space-age shower with light and sound! Fluffy towel, gowns and slippers, plus generous toiletry amenities. Iron and ironing board or use our laundry facility.